A storm-damaged tree not only presents a real challenge but, if not handled properly, can be potentially dangerous. Storms are bound to happen year round and while you may get a kick out of watching the lightning dance about the sky, there’s also a very serious risk of extreme damage. Storms can cause major damage to trees, potentially even killing them, bringing them down, and damaging nearby homes or businesses. 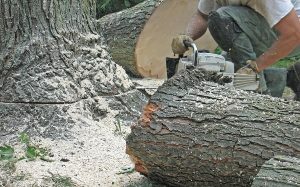 Anyone who has dealt with a storm-damaged tree knows how difficult it can be to recover, so if you’re dealing with a tree that has been damaged by a storm, here are some tips to help keep you safe and cleanup afterward. You should always prioritize safety when dealing with damaged trees. You’ll want to inspect the area for branches, tree limbs, or even larger parts of the tree that may be leaning against power lines. If so, don’t touch anything yourself and call a specialist like us at Harford Tree to remove everything for you. Those power lines may look broken and thus rendered safe, but the reality is there could still be dangerous live wires. If there aren’t any obvious urgent problems, you’ll want to survey the area and take note of any other issues. This could include hanging or damaged branches or branches with splits. If the trunk itself has decayed or has holes, cavities, or splits, that could also be dangerous. The more details you can get, the better you will be able to deal with the issue. If any of the above has happened, you’ll definitely want to call a professional to help clean up the situation, as while it may not be an immediate danger, it could still be harmful. If there’s any possibility that a tree could fall, homeowners without the right equipment or training shouldn’t try to deal with it themselves. This entry was posted on Friday, August 18th, 2017 at 9:42 am. Both comments and pings are currently closed.